Conference registration includes morning and afternoon teas, light lunches, conference materials and the welcome function. Please note extra payments are required for the conference dinner, end of conference BBQ and the field trip day. 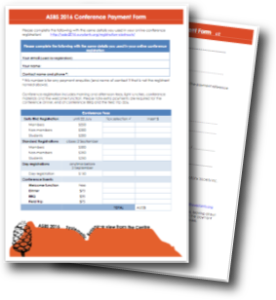 Download and complete a payment registration form and return by email to asbs2016@ourplants.org (if you prefer not to email the form we also have an electronic dropbox). The payment will be processed by the Australasian Systematic Botany Society Inc. If you wish to pay for more than one registrant with a single payment complete multiple first pages and a single second (payment details) page with a list of all names included. Send all these forms together.